This article is about the crew member. 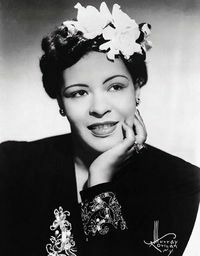 For the character, see Billie Holiday (character). Billie Holiday (born Eleanora Harris; April 7, 1915 – July 17, 1959) was an American jazz singer-songwriter. She wrote the song "God Bless the Child", which was covered in The Simpsons Sing the Blues. Modified on September 12, 2014, at 07:29.